Stranger, Baby, by Emily Berry. Faber & Faber, 64 pp., $15.95. In 1981, a thirty-seven-year-old professor from Stanford University died while hiking in the Philippines where she and her husband, Renato Rosaldo, were researching the Ifugal, a community known for its centuries-old rice terraces carved high in the mountainside. But it was among another tribe, whose traditions once included head hunting as a means of purging grief-induced rage, that years earlier Rosaldo discovered and spent more than a decade trying to understand liget (pronounced “ley-gut”), an emotion unique to the Ilongot culture that, while energizing, sometimes engenders violence from bereavement. Felt singularly and also expressed communally, the Ilongot experience liget as vitality, a way of articulating an otherwise all-consuming despair. Although Rosaldo devoted himself to studying the Ilongot and their customs, for a long time liget itself remained conceptual, muted. It was only later when the anthropologist was back in California and thousands of miles from the rainforest where his wife died that, overcome with loss, a surge of feeling began to overtake him. The emotion was so powerful and alien that, as Rosaldo recalls, he pulled his car over to the side of the highway. Alone, he began to moan. What came next was an electric feeling and an out-breath, one the scholar recognized, finally, as the very essence of liget. Rosaldo let the waves of despair wash over him. Afterwards, he felt relief. So much, in fact, that the grief-stricken spouse soon made a regular practice of driving to remote places in order to practice liget without fear of interruption or judgment. On the margins of isolated roads he finally felt free enough to let his wailing explode into a guttural howl. I first heard Rosaldo’s story on National Public Radio’s Invisibilia, a podcast that investigates the underlying feelings and ideas that influence our human behavior. While I found the two-part episode fascinating, at the time I had no idea just how thoroughly the show’s account of the intersection between grief and sound, language and death, would prepare me to read a book of poetry recently published in England. Emily Berry’s Dear Boy won Great Britain’s 2013 Forward Prize for Best First Collection, as well as its Hawthornden Prize. The poet follows her full-length debut with Stranger, Baby, a finalist for the Forward Prize, which narrates the aftermath of loss. “It is perfectly true that she obsessed me,” acknowledges the speaker of “Ghost Dance,” “in spite of the fact that she died when I was thirteen, / until I was forty-four. A mother’s death lasts a lot of years / What shall we do?” What Berry does is test the lyric’s capacity to render ongoing pain by exploring the tension between absence and attachment. Casting a cool shadow across Stranger, Baby is an epigraph sourced to Sigmund Freud: “The loss of a mother must be something very strange …” But if Freud strikes a clinical note, it’s because Berry resists anything approximating the confessional. In a register that’s often matter-of-fact she instead presses language structurally, experimenting with staccato lines, caesurae, white space, prose fragments, and a lyric play written in two voices, among other more traditional poetic forms. What becomes clear in reading Stranger, Baby is that bereavement is ultimately unfathomable, at times teetering on the absurd. In other words, the collection’s true subject isn’t limited to Berry’s private grief, but hinges on the poet’s inability to adequately express the far reaches of despair, thereby reflecting the gifts and limitations of elegy itself. … and saw the sign of the anchor burning. “[I]t is human nature to stand in the middle of a thing” begins “A Grave,” Marianne Moore’s haunting meditation on the sea and the living and dead that inhabit it, “but you cannot stand in the middle of this.” And, yet, to stand, or, perhaps more precisely, to take a stand, is exactly what Berry attempts. As she observes in “Picnic,” “If you are not happy, the sea is not happy / … Watching the sea is like watching something in pieces continually striving to be whole.” Without question Berry recognizes in herself the ocean’s brokenness. What rises, she affirms again and again, will pitch then break before dragging its body back under. But although its movement recurs, water takes many shapes—a fact Stranger, Baby exploits. Throughout the collection, the sea at times seems to be Berry’s mother, the fathomless body of grief, even the poet herself. The ocean comforts, lambastes, seduces, eclipses. “The mood of the sea is catching,” concedes Berry, “Your eyes wear out from all the glitches / I sat there watching it and I can assure you it is so / Its colour became the colour of my eyes”; meaning, whether it hurts or heals water transforms what it touches. What’s to regret? Her words? Tears? What Dickinson calls “the Auction / Of the Mind of Man”? Or, perhaps it’s her tendency to withhold? 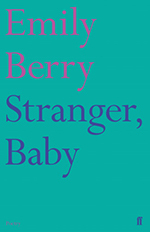 As much as I enjoy Stranger, Baby, I long for more tenderness—lapses not into nostalgia or confession, but moments when Berry might reveal a fuller portrait of the book’s composite mother figure. Perhaps this desire reflects my expectations regarding form: part of elegy’s tradition is decorum; after all, elegy memorializes the loved one via lament and praise. Whether the poet ultimately receives or refuses consolation, as D.A. Powell suggests, or eventually plunges further into grief doesn’t matter. Whatever their outcome, elegies typically reveal some personal details about the deceased, even if those details are imagined or suggested via metaphor. We learn particulars about the pub-going fisherman in Seamus Heaney’s “Casualty,” for instance, or those friends lost to AIDS in Thom Gunn’s The Man With Night Sweats. Even public figures held at a distance like Abraham Lincoln, Emmett Till, and Yeats are made more accessible by elegists Whitman, Brooks, and Auden. Traditional elegies, in other words, individualize their subjects. Through intimacy they relinquish distance and time. In fact, the more I read Stranger, Baby, returning again to the poems not out of obligation but with curiosity and true admiration, the more I realize I don’t want to change Berry as a poet. Why criticize her instinct to intellectualize pain when it proves generative and inventive? After all, at a time when so many young writers labor to appear clever, Berry’s slyness doesn’t show the sweat. “Freud’s Horses,” an odd poem made of several fragments, for example, suddenly magnifies via its last unpunctuated line. “I am thinking of eating a pomegranate,” Berry off-handedly adds, abruptly shifting from the main subject. The speaker’s casual remark about craving fruit, meanwhile, sends Persephone and Demeter surging into the stanza casting the poem in a richer and more complicated light. Elsewhere in Stranger, Baby Berry appears to invert the myth of the abducted child so that it isn’t the daughter but the mother who perpetually returns to the underworld, as when in “Procession” the speaker recalls that “Once I saw my mother rowing // At night across water // I called to her and she looked back // Smiling beautifully”. The aforementioned lines feature one of the collection’s rare moments of genuine interaction, even as the primary gesture remains one of leave-taking. In Stranger, Baby, however, Berry’s solitude isn’t ultimately unrequited: though the mother figure dies, it’s the poet’s fraught relationship with language that survives. In this sense, art becomes a lasting companion as Berry strives to transform her isolation and abandonment into something alive on the page. Laid it all out like tidal wave. Coming for me. Coming for you. Thought, with the right attitude, you could train it to sing. Tidal Wave don’t sing, said Tidal Wave. What the poem forewarns is that feeling in its purest form—whether grief recorded in Stranger, Baby, or its antithesis—is inevitable. “Coming for me. Coming for you,” there’s no hope of staying dry as the waters rise and gather strength. So why do we, as Berry points out, try to wrench anguish into something beautiful? Why do we believe we can “train [feeling] to sing”? “The wave always returns, and always returns as a different wave,” claims the Russian poet Marina Tsvetaeva in her essay “Poets with History and Poets Without History.” And in Berry’s case in “Tidal Wave Speaks” and throughout her collection, as is the case with Rosaldo’s experience with liget, the wave returns in greater volume and force. Like many poets, Berry asks whether it is possible to shape grief. What sets Stranger, Baby apart, however, is that as Berry ignores, confronts, affirms, obsesses, and sings about a mother who is everywhere and nowhere, she further questions whether shaping loss actually changes our concept of it. Moore posits in “A Grave” that if things dropped in the ocean “turn and twist, it is neither with volition nor consciousness.” But in “Canopy” and throughout Stranger, Baby Berry works to prove otherwise. She’s a writer who’s wholly immersed, yet willful; at times conflicted, but hypnotic. By culling phrases, turning them over while consistently interrogating her own feelings and assumptions, Berry poses difficult questions: How do we shape loss? Is it ever really possible for language to consol? Where is art in all of this? Where is love? Shara Lessley, a contributing editor, is the author of Two-Headed Nightingale and The Explosive Expert’s Wife. With Bruce Snider, she is the co-editor of The Poem’s Country, an anthology of essays on place and poetic practice. She lives in Oxford, England.